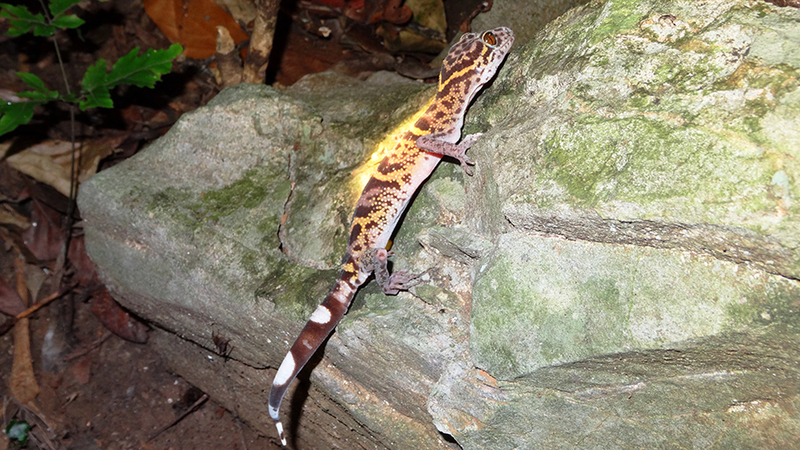 In their study, a Vietnamese-German research team, led by PhD candidate Hai Ngoc Ngo of the Vietnam National Museum of Nature in Hanoi, provide an overview of the evidence for domestic and international trade in tiger gecko species and update the information about the abundance and threats impacting the subpopulations of the Vietnamese Cat Ba Tiger Gecko in Ha Long Bay. By presenting both direct and online observations, interviews and existing knowledge, the scientists point out that strict conservation measures and regulations are urgently needed for the protection and monitoring of all tiger geckos. The research article is published in the open-access journal Nature Conservation. Cat Ba tiger gecko (Goniurosaurus catbaensis) in its natural habitat. Photo by Hai Ngoc Ngo. “Tiger geckos are neither sufficiently protected by law nor part of conservation programmes, due to the lack of substantial knowledge on the species conservation status and probably due to the general lack of public as well as political interest in biodiversity conservation,” they explain. “To date, exact impacts of trade on the species cannot be identified, as data of legal trade are only recorded for species listed in the CITES Appendices”. Having spoken to local dealers in Vietnam, the team found the animals were traded via long and complex chains, beginning from local villagers living within the species’ distribution range, who catch the geckos and sell them to dealers for as little as US$4 – 5 per individual. Then, a lizard either ends up at a local shop with a US$7 – 25 price tag or is either transported by boat or by train to Thailand or Indonesia, from where it is flown to the major overseas markets and sold for anywhere between US$100 and 2,000, depending on its rarity. However, many of these delicate wild animals do not arrive alive at their final destination, as their travels include lengthy trips in overfilled boxes under poor conditions with no food and water. The inclusion of all tiger gecko species from China and Vietnam in CITES Appendix II was recently proposed jointly by the European Union, China and Vietnam and is to be decided upon at the Conference of the parties (CoP18) in May-June 2019, held in Sri Lanka.